In “The Denationalization of Money” Hayek argued that you should be able to pay taxes with privately-issued currencies. However, this would in effect turn those ‘private currencies into’ de facto state currencies, or forms of government ‘fiat money’. For some reason Hayek chose to ignore this massive contradiction in his argument. Essentially, what he was actually arguing was that private corporations should be granted special state powers, i.e. the power to issue money backed by the state’s legal powers of taxation. I thought that this was a very insightful observation by Philippe, though its significance for me may be somewhat different from its significance for Philippe. In my criticisms of Hayek’s free-banking position – I call it a free-banking position even though free banking may be a misnomer inasmuch as Hayek advocated banks’ creating new currency units not just allowing banks freedom to create a complete menu of liabilities denominated in existing currency units – my argument was that newly created currency units would be worthless unless the banks made them convertible into some outside asset not under their control. Or in Nick Rowe’s helpful terminology, Hayek advocated free-alpha-banking, while conventional free bankers advocate free-beta-banking. The reasoning behind my argument is that the value of a pure medium of exchange depends entirely on its expected value in exchange, so if a currency unit is not defined in terms of a commodity providing a real, valuable, service apart from being used as money, people will eventually realize that its value must go to zero. Any positive value that it may temporarily have is just a bubble, and, like every bubble, it will burst. However, unlike the private issuer of a currency unit, a sovereign issuer can impart a real value to a fiat currency by making the currency acceptable for discharging tax liabilities, creating a real demand for the currency distinct from its use as a medium of exchange. Using this argument, I have suggested that bitcoins are a bubble, though it is possible that are some techie reasons that I don’t understand why bitcoins could provide real services that would allow them retain a positive value. At any rate, the point made by Philippe — that if governments were to accept newly created private currency units in payment of taxes – they could retain their value just as fiat currencies issued by governments do – is a point that had escaped me in my criticisms of Hayek. So, well done, Philippe. However, Philippe seems to carry this valid point a bit too far, accusing Hayek of a massive contradiction in arguing that private corporations be granted special state powers. The problem with that argument is that it begs the question what is special about money that confers the sole power to issue money to the state. I actually once wrote a paper trying to answer that question (once again relying on an argument that I heard from Earl Thompson) published in a volume called Money and the Nation State. I summarized the argument in chapter 2 of Free Banking and Monetary Reform. The short answer is that currency debasement may be necessary as a means of emergency taxation when a sovereign is faced with a hostile military force threatening its survival. To profitably debase a currency, you have to be the monopoly supplier. Ergo, sovereigns that monopolize the mint or the supply of currency have a better chance of surviving than sovereigns that don’t. Hayek was a staunch anti-communist, cold warrior, so the defense argument, at least on some level, would have appealed to him. But otherwise, it’s not clear to me why Hayek could not have said that, apart from certain national-defense functions, there really are no government services that may not be provided by private enterprise. After all, we do allow various services that were once exclusively provided by the government to be provided by private enterprise. I don’t say that this is always a good thing, but it doesn’t seem to me inherently unreasonable to believe that the burden of proof is on the one claiming that the state has an exclusive right to discharge a particular service, not on the one who questions that such an exclusive right exists. Having said that, I will also say that it also seems perfectly reasonable for a government to say that a tax obligation that it legitimately imposes – I freely admit that I am now begging the question where this legitimate power comes from, but only libertarian fanatics dispute that power – can only be discharged in terms of a currency unit that the government itself specifies. And implicitly or explicitly, George Selgin and other free bankers — i.e., free-beta-bankers — seem to be perfectly OK with the government specifying the currency unit in terms of which tax obligations may be discharged. In other words, the government may impose a tax obligation on me that is specified in dollar terms. To discharge it, I have no choice but to pay the government the requisite number of dollars, either delivering the government’s own currency or delivering a private (beta-bank) money denominated in dollar terms. The peculiarity in Hayek’s argument is that he was proposing that governments impose a tax liability in, say, dollar terms, and then accept payment in some other currency unit without specifying any method by which an obligation specified in dollars would be discharged in terms of another currency unit. Any creditor is free to specify at the time an obligation is created the terms on which the debt will be discharged (subject of course to legal tender laws, but for purposes of this discussion I am ignoring legal tender laws which are not the same as tax acceptance). The government is not just any creditor, but there doesn’t seem to me to be any compelling reason why a government should not be entitled to say we have created this obligation in terms of dollars and it must be discharged in terms of dollars. And, if I am right in asserting that acceptability in payment of taxes is a necessary condition for an inconvertible fiat money to retain value, there does seem to be something funny about Hayek’s argument for the creation of private fiat moneys, even if it is not a flat-out contradiction as Philippe claims. What is funny is the degree to which the viability of a Hayekian private fiat currency is dependent on its being accepted by the state as payment for taxes. Moreover, Hayek’s argument was that there would be a discovery process in which many competing currencies would vie for acceptance with the market eventually choosing one or a few currency units as somehow being the most desirable. Hayek thought that the currency unit with the most stable value would eventually capture the largest market share. There are lots of problems with the argument, especially that it ignores the network effects that tend to produce an entrenched monopoly, and the extreme path dependence of such outcomes, but on a practical level, it seems almost unimaginable that a government would, or could, allow any number of distinct competing currency units to be simultaneously acceptable in payment of taxes. I do not mean to be overly critical of Hayek, for whom I always have had the greatest admiration, but he had an unfortunate tendency to get carried away with certain utopian ideas and proposals, for example his idea of separating the law-making power from the governing function of parliaments into two distinct bodies, going so far as to propose a method for selecting members of the law-making body under which people at the age of 35 would each year elect a number of their contemporaries to serve a 15-year term in the law-making body, the law-making body being composed entirely of people between the ages of 35 and 50. He presents the idea in volume 3 of Law, Legislation and Liberty, a wonderful book of great philosophical depth and erudition. But it is amazing that Hayek felt that such an idea could ever be implemented. I don’t like to think so, but it occurs to me that his toleration for certain dictators might have had something to do with his imagining that they could be persuaded to implement his ideas for political and constitutional reform. His Denationalization of Money was a similar flight of fancy, based on some profound insights, but used as the basis for practical proposals that were fantastically unrealistic. It’s customary at the Passover seder for the youngest person in attendance to ask four questions about why the first night of Passover is different from all other nights. For some reason, at my seder a different question was raised as well: what are bitcoins all about? I guess everybody wants to know about bitcoins now. Well, how embarrassing is that? 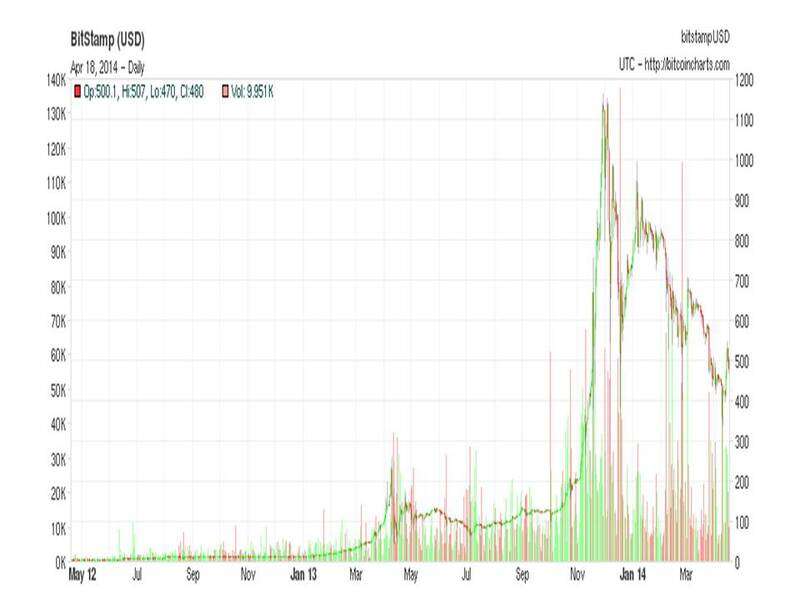 Not only do I not understand why bitcoins have spectacularly increased in value since their inception (though the current price of a bitcoin is less than half of what it was last December), I don’t even understand why the market price of a bitcoin is now, or ever has been, greater than zero. Why am I so perplexed about bitcoins? The problem I have is that bitcoins can’t be used for anything except as a means of payment for something else. Bitcoins provide no real service distinct from being a means of payment. Think about it; if a bitcoin can’t be used for anything except to be given to someone else in exchange, that means that someday, someone is going to be stuck holding a bitcoin with no one left to give it to in exchange. When that happens, that stinky bitcoin won’t be worth a plum (or plugged) nickel, or a red cent. It will be as worthless as a three-dollar bill. Now I grant you that that final moment of clarity might not happen for a long time – maybe not even for a very long time. But if anything is certain, it is certain that, sooner or later, such a moment must certainly come. But if it is certain that ultimately no one will accept a bitcoin in exchange, then it follows that no one forseeing that inevitable outcome would accept a bitcoin in exchange prior to that moment unless he or she is confident that there is some sucker out there who will accept in the interim. But since when does a theory of asset valuation premised on the existence of an unlimited supply of suckers count as an acceptable theory? Under the normal rationality assumptions that economists like to use, it is not possible to rationalize a positive price for a bitcoin at any point in its history. So if, as the above chart so dramatically shows, bitcoins are in fact trading at a positive price, how does one avoid concluding that bitcoins are a massive bubble, a Ponzi scheme that must inevitably collapse, as soon as people realize where things are headed? 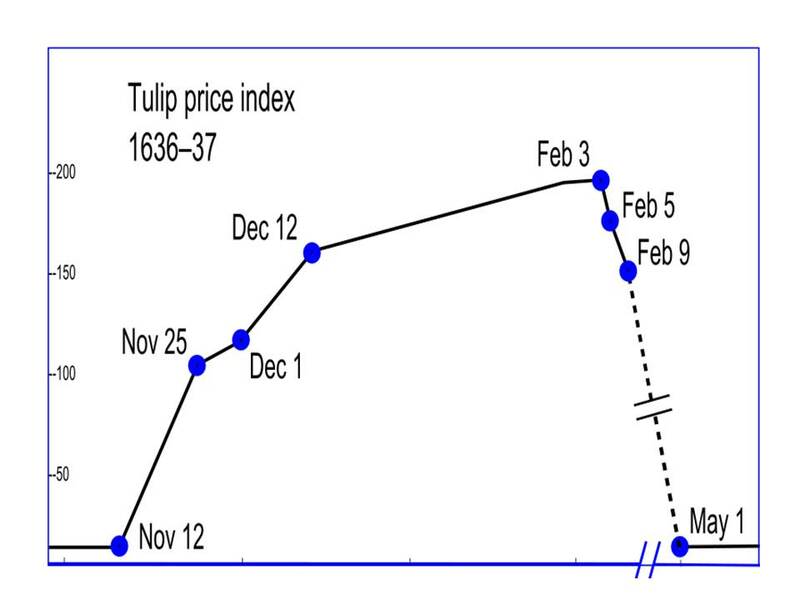 To see just how massive a bubble bitcoins are, compare the above chart to this one constructed by Earl Thompson from actual prices in tulip contracts during the Dutch tulip mania of 1636-37. Compared to bitcoins, the tulips were barely more than a blip. Now one could respond that if bitcoins are a bubble, then so is fiat currency. That is a pretty good response, and the positive value that we typically observe for most fiat currencies is far from unproblematic. But, as I have pointed out before on this blog (here and here), it is possible to account for the positive value of fiat currency by reference to its acceptability in discharging tax liabilities to the government. The acceptability of fiat currency in payment of taxes is a real service provided by fiat currency that is conceptually distinct from, though certainly facilitated by, its acceptability as payment in ordinary transactions. So, as long as one expects the government issuing fiat currency to remain in power and to be able to punish tax evasion, there is a rational basis for the positive value of a fiat currency. The backward induction argument that establishes the worthlessness of bitcoins does not apply to fiat currency. Another possible explanation for the positive value of bitcoins is that they are very useful to those wanting to engage in illegal transactions on line, because, unlike other forms of electronic payment, payment via bitcoin is hard to trace. That is certainly a good reason for people to want to use bitcoins in certain kinds of transactions. However, the difficulty of tracing transactions via bitcoin is not an explanation of why bitcoins have a positive value in the first place, only an argument why, if they do have a positive value, the demand for them might be greater than it would have been if it were not for that advantage. Without an independent explanation for the positive value of a bitcoin, you can’t bootstrap a positive value for bitcoins by way of the difficulty of tracing bitcoin transactions. So there you have it. As far as I can tell, the value of a bitcoin should be zero. But it’s obviously not zero,and though falling, the value of bitcoins is showing little sign of moving rapidly toward its apparent zero equilibrium value. There seem to be only a couple of ways of explaining this anomalous state of affairs. Either I have overlooked some material fact about bitcoins that might impart a positive value to them, or there is a problem with the theory of valuation that I am using. So I ask, in all sincerity, for enlightenment. Help me understand why bitcoins are not a bubble.